I’m headed to Wyoming for a week in July to trace the movements of my ancestor, cavalryman and general hell-raiser John Benton Hart, in 1865-68. He left a rich memoir of his experiences at the end of the Civil War and thereafter on the frontier. My latest article extracted from this lode appeared this spring in Kansas History magazine. Now I’m off to Casper to be at the 150th anniversary observance of the Battle of Platte Bridge, in which allied Sioux, Cheyenne, and Arapahoe Indians made a concerted attempt to shut down the Oregon Trail. 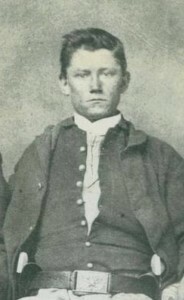 Johnny, as everyone called him, was one of two dozen men to ride into ambush under doomed Lieutenant Caspar Collins, for whom the Wyoming town is named.